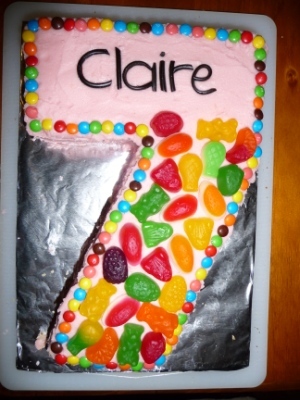 Every year I make a cake for my niece, Claire. This year she wanted a number '7' and the only cake she was mildly interested in the WW cake book was the photo one with the lollies all over it. So, this was my best effort at putting lollies all over the cake without going too overboard with it. I used mini m&ms for the outline border and a sliced licorice strap for the name. 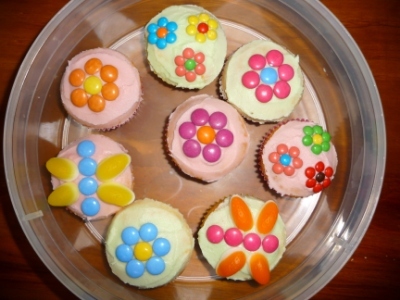 I also made a bunch of cupcakes for her to share with her friends. I have used Smarties and mini m&ms and assorted soft lollies. I highly recommend the Black&Gold lolly selection at IGA for cake decorating - they are small bags and lots of variety to choose from. 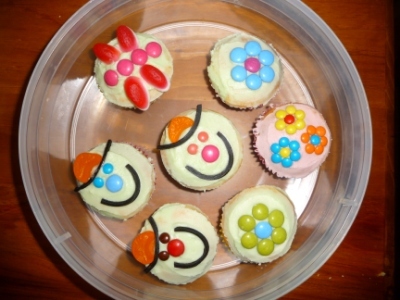 Trivia: Niece of 7 went for the face cupcake first and niece of 4 went for the mini m&m flower cakes. Cute!